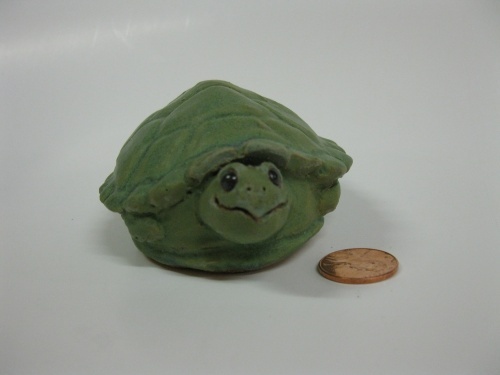 Located in Haydenville, Massachusets, Phinney Pottery produces handmade pottery of all kinds: stoneware garden sculpture and pun flowers, wheel-thrown bird baths, functional and whimsical teapots, small ceramic sculpture and netsuke miniatures, lamps and story book character night lights, porcelain baby sets (cups and bowls) with animal designs, and, of course, mugs, pitchers, cookie jars, and dinner ware. The studio is open to the public but you should call ahead if coming from a long distance. Custom commissions are welcome, but for standard items you are welcome to purchase online from the gallery. Enjoy! This is a sample of the porcelain baby sets I make. 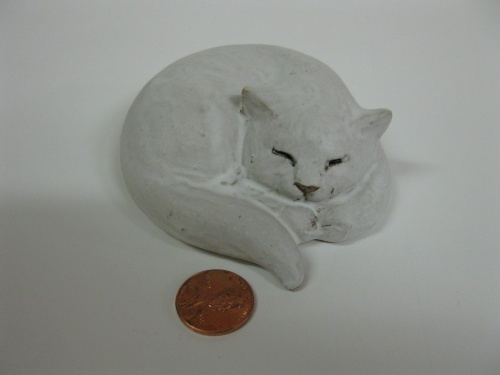 I impress the animal designs into the wet clay, then refine them by carving. I glaze them in a fluid lead-free glaze, blue as shown, or green, yellow or deep cherry pink. I have carved many animal stamps to use: cats, elephants, horses, dragons, dinosaurs, dolphins, and more. Contact me to see what colors are currently available in which designs. Shipping charges are extra. 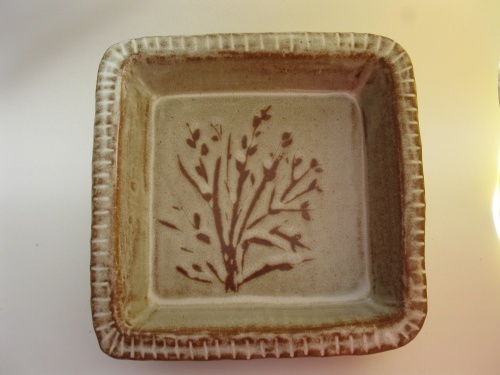 A 9" square baking dish with a pattern of pussywillows. We use ours primarily for brownies or gingerbread but sometimes for baking chicken. A ruggedly constructed kitchen essential, useful for pounding garlic for garlic butter, basil for pesto, or even kid's tylenol for blending into jelly! 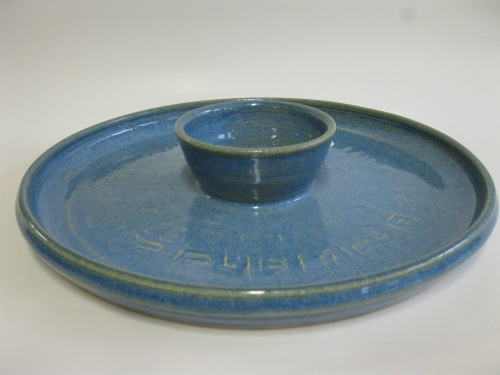 This pie pan is made of a high-fired stoneware clay containing spodumene, a mineral which has a low thermal expansion, and is therefore useful in creating heat resistant ware. 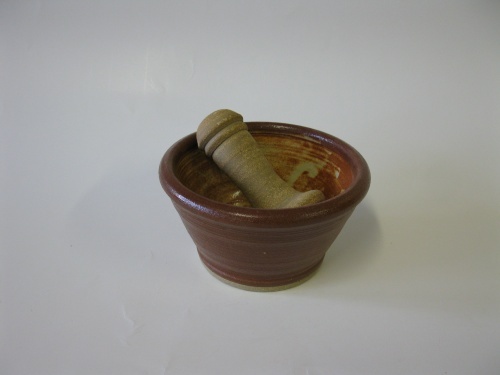 The glazes used are non toxic and safe for food. A clay loop on the back makes for easy hanging on a wall. A sample of the pie pans I make: these are slab-rolled (like pie dough!) 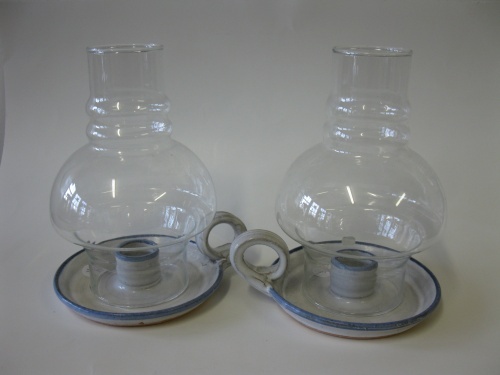 and drape-molded in three sizes: 12 ", 11" , and 9" diameter, and 1 and a half inches deep. 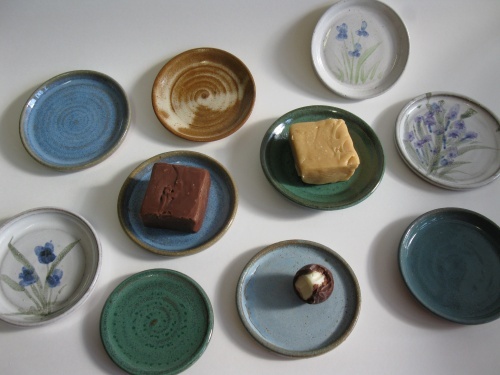 The glazes are varied but are all food safe. 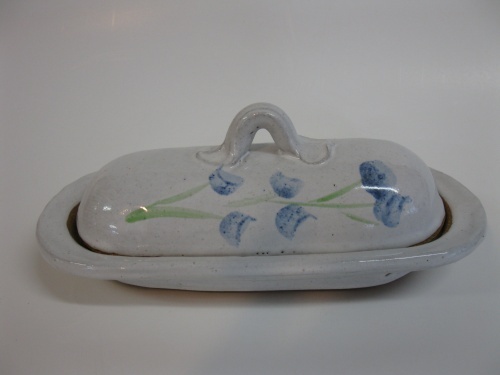 This butter dish has a shiny white glaze and blue and green floral decoration. It holds a stick of butter and will also fit into a butter compartment in a refrigerator. 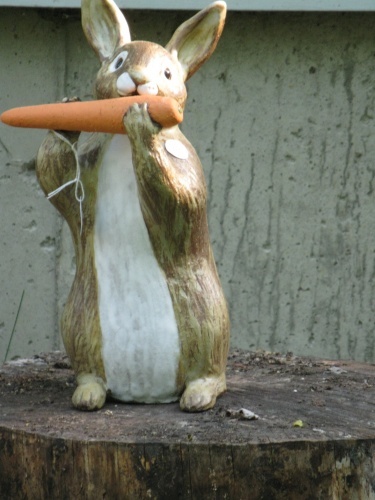 This stoneware rabbit is gobbling a carrot--no, wait, he's playing a flute! Very quietly. Wheel thrown stoneware, glazed and fired in my propane burning kiln. 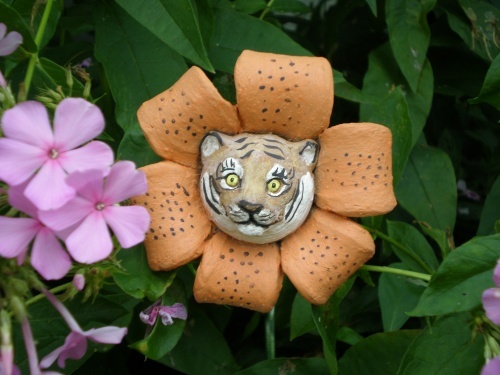 This wheel-thrown stoneware flower is a zinnia, yes, but also a pun on the name of a favorite historian of mine, Howard Zinn, author of "The People's History of the United States". 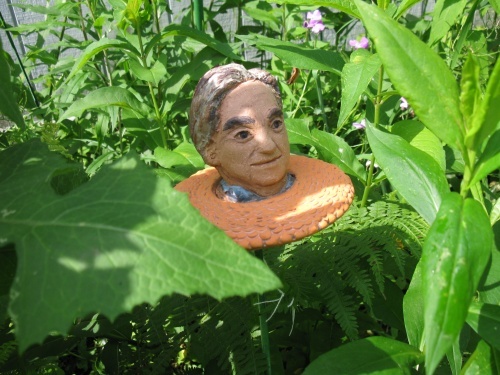 Not exactly a portrait bust, but a playfyul tribute, nonetheless. On a threaded metal rod, it stands proud in a garden, never wilting. A flower sprite with a bloom that never withers. Thrown on the potter's wheel as a hollow form in stoneware clay; the petals and facial features are added when the shape has tried slightly. Blue- glazed "petals" and natural stoneware "skin" with colored clay slip on her eyes and mouth. On a metal "stalk". Who said it had to be a fairy who says "in the cow slip's bell I lie"? 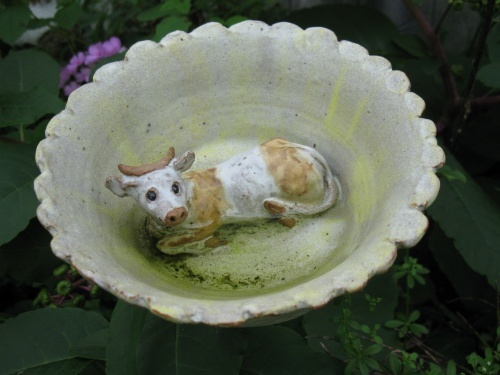 This wheel thrown stoneware "pun flower" has a miniature cow curled up inside it. Glazed with high temperature glazes and fired in my gas kiln, it has a metal rod glued into it which serves as its stalk. 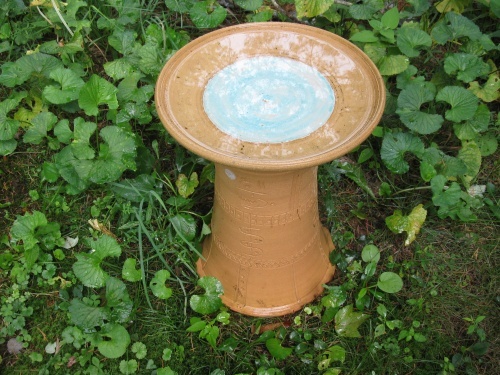 A miniature bird bath for a small garden. 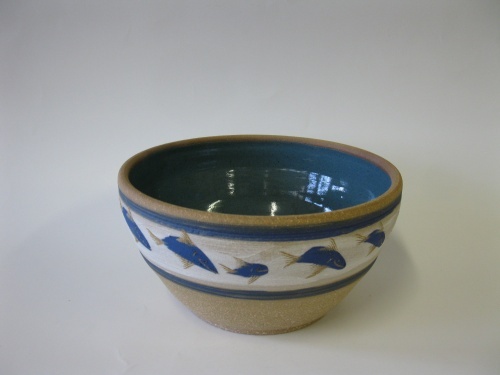 Fired at a mid temperature range in my gas kiln, it has an unglazed base decorated with incised patterns, and a removable top plate with a turquoise interior and an unglazed, incised rim. 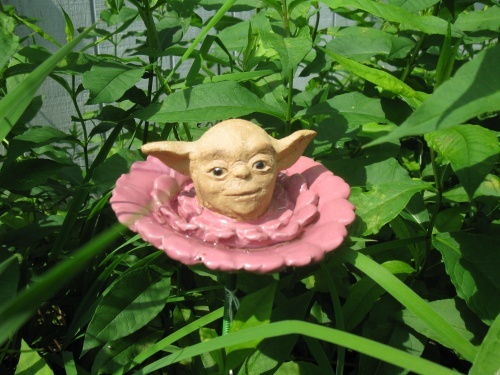 Yoda looks out serenely from his flowery home. The wheel thrown flower is glazed with a high fire pink glaze ( very like a rhodadendron's) while the hand-sculpted face is natural clay-colored with black-glazed eyes. 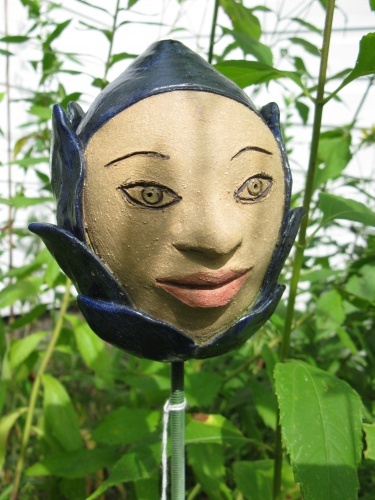 The flower rests securely on a green metal stalk. A tiny collie dog stands atop a clay cauliflower. High fired and glazed stoneware, hand made and wheel thrown. On a green metal "stalk". A small girl smiles tentatively out from her blossom. 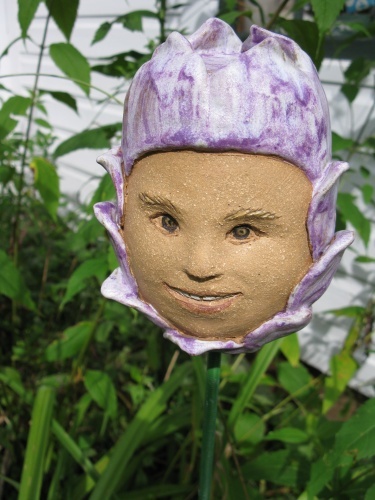 She's a handmade flower made of sturdy stoneware, glazed purple on her petals, with a metal stalk made of threaded rod painted green. 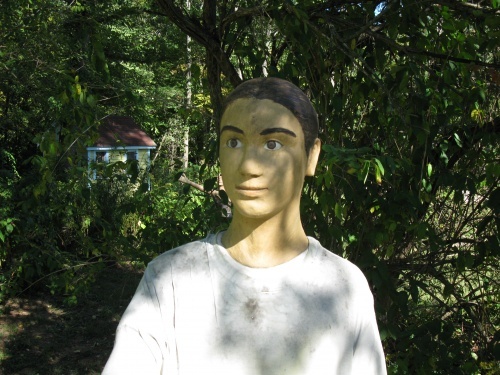 This is a photo of one of my full size outdoor statues. I have made a dozen or so at intervals during my life as a potter. Each represents a person important to me--in this case, my son Matt as a high schooler. I will make these large pieces to order for installation in a customer's garden. Depending on size and complexity, price ranges from 00 to 00. This rare woodpecker was thought to be extinct until a couple of years ago when several people claimed to have seen one in the swamps of Arkansas. I made this one right before that news came out, as one of a nesting pair. The male was bought by someone who mistook it for a Pileated. 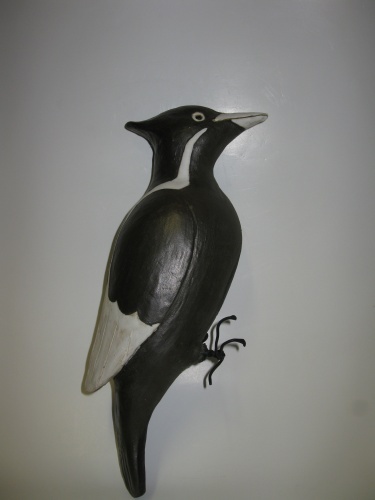 Luckily, being made of clay, it can survive in a cold climate better than a real Ivory-Bill! 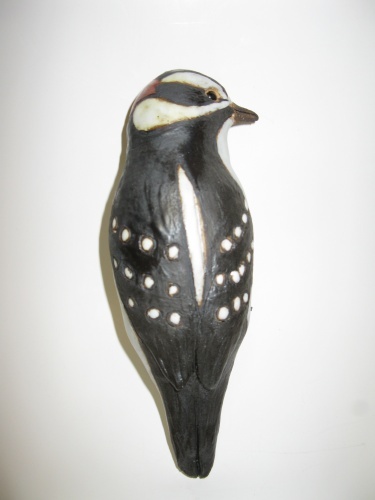 This cheerful little bird is a tree or wall-clinging bird, hanging by its belly from a nail inserted into the wood. Made from stoneware clay as a hollow egg form spun on my potter's wheel, then shaped as it dries. 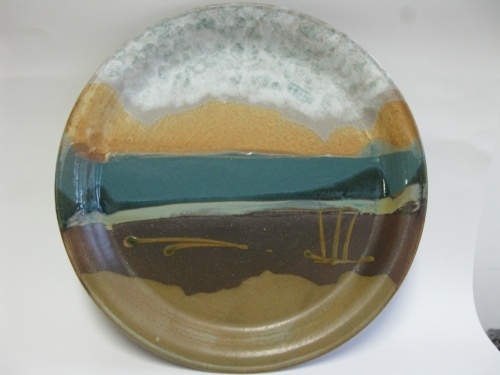 Glazed with stoneware glazes and fired in a propane-burning kiln. plus shipping charges. 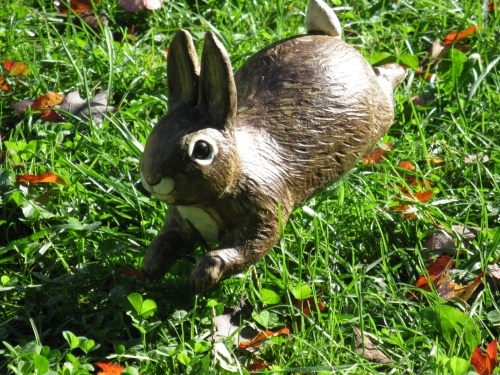 This wheel thrown and altered stoneware rabbit is a commissioned piece, ordered the end of May during my annual Haydenville Craft Fair. I enjoy working to order for customers, and can make similar rabbits for customers who don't mind waiting for a piece to be made up. 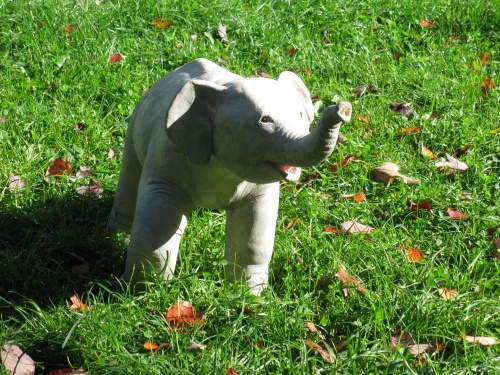 This baby elephant was made as a special commission. I delight in doing work to order, although I have a slow turnaround time. 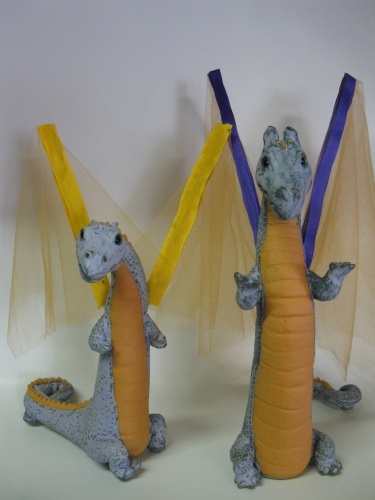 These endearing young dragons are actually vases; with a few flowers in each "wing hole", they represent the power of Spring and new growth. When they're not wearing flowers they like to sport these gauzy, beribboned wings that are reminiscent of medieval ladies' hats. 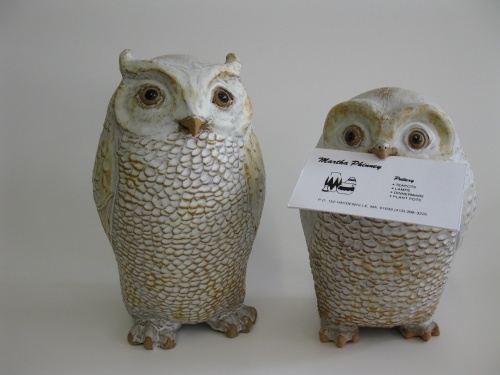 Each of these wheel thrown stoneware owls will hold a message for a family member or a "note-to-self" in its beak while quietly gazing at you with life like eyes. Begun as an "egg" of hollow clay on my potter's wheel, and altered, added to, and feathered during the drying process, each is glazed with stoneware glazes and fired in a gas-fueled kiln. This lifelike little nuthatch has the ability to cling to a tree trunk or a wall, thanks to a hole in its underbelly which can be hooked over a finish (headless) nail hammered into a tree, fence, or woodwork. It is designed to hang head downwards, looking out at the world. Begun on a potter's wheel, then altered as it dried, the glaze was brushed on and it was fired to cone 7 in my gas kiln. Then its wire feet were twisted, coated in rubber, and attached. They're bendable! 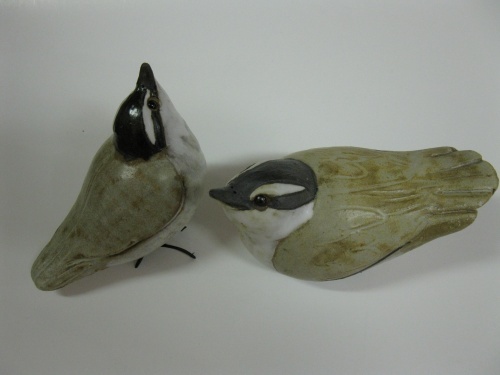 I make many birds like these chickadees by throwing an enclosed hollow "egg" on the potter's wheel, and then shaping it as it dries. 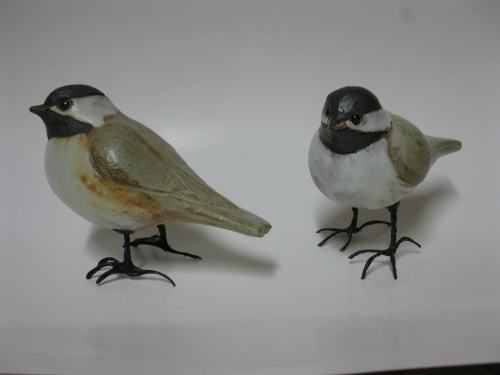 I make nuthatches, woodpeckers, tufted titmice, juncos, blue jays, and more. Lots of fun! These pictured birds have "poseable" feet mad of twisted wire dipped in a rubber coating. Each is .00 One of these chickadees has been sold.Some of my birds perch on wood or clay "branches" and can be hung with a loop of wire. Price varies depending on size and complexity of bird, from 40 to 65 dollars, and up. Shipping charges extra. LAMPS and night lights, lanterns, and sconces. A candlestick with chimneys to protect the flame from being blown out by a gust of wind: especially useful on a porch or near a doorway. Sized to fit most candles. Wheel thrown mid temperature ware, fired to about cone 4. In Beatrix Potter's tale, she was a very particular housekeeper, and kept her burrow very tidy indeed. 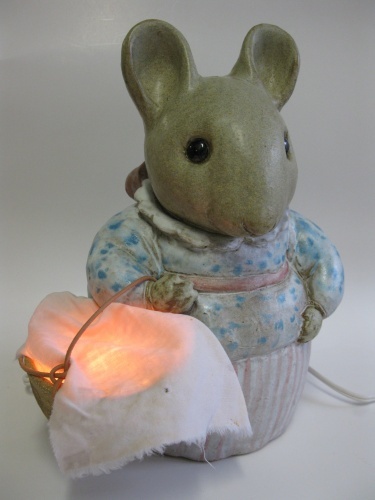 With a basket over her arm, in this stoneware incarnation, she carries a little light into a darkened room. A candelabra bulb (a Christmas tree light- size bulb) in a pigtail socket provides the light in her basket. Glazed and fired to about 2200 in my kiln. 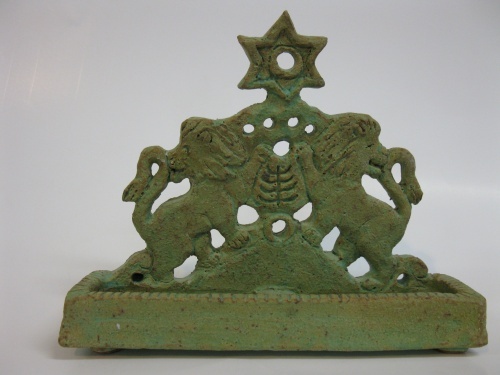 This clay menorah with its matte green glaze is inspired by the pressed brass menorah belonging to my friend Fern--a family keepsake, which has lit many a Hannukah celebration. Mine has an added feature, a little rim enclosing the candle area to prevent the melted wax from running across the table. I spent a weekend at Fletcher Farm School last summer learning how to make cut and pierced lampshades. What fun! This is a pattern I developed from a drawing I did. 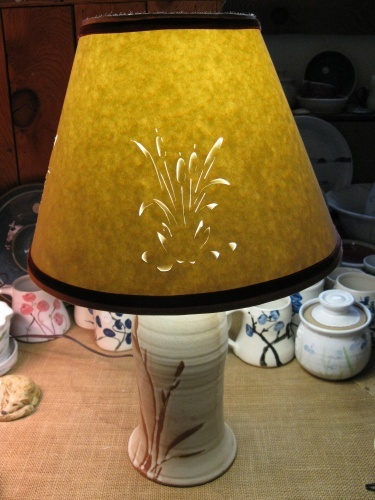 The shade is designed to fit this stoneware lamp which I brought with me to the workshop. 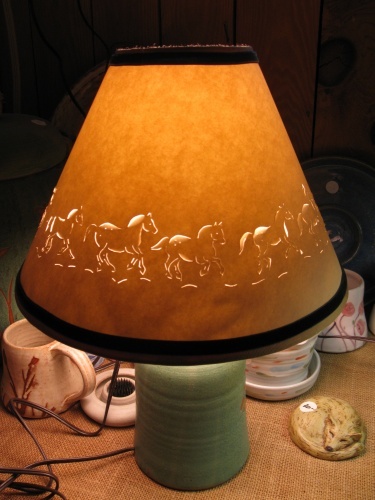 I hope to make shades to go with most of my lamps, and perhaps some to sell separately if customers are interested. 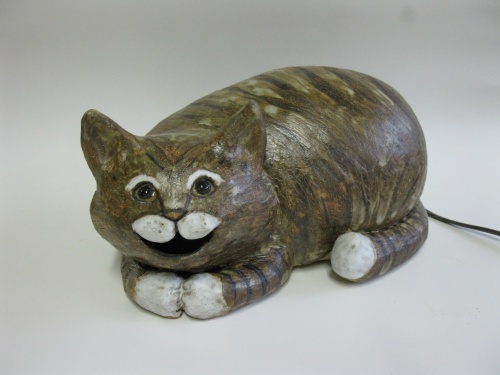 Like Lewis Carroll's famous cat, this cat's smile remains when the cat disappears in a darkened room. A candelabra bulb is held by a pigtail socket in the cat's back side. When the line switch is turned on, the smile lights up. Made of stoneware, wheel thrown, with glazes brushed on. Fired to about 2200 degrees. Each cat I make is unique, but similar to its fellows, as these samples show. , with shipping charges extra. 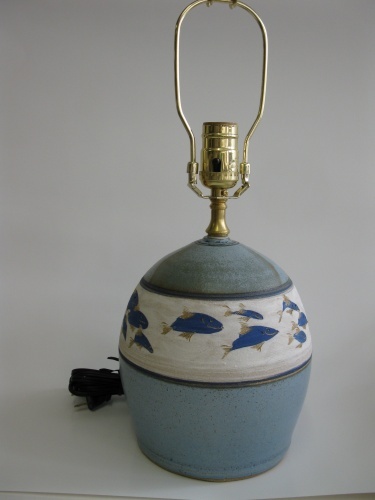 A blue-glazed stoneware lamp with a pattern of swimming fish slip painted on its unglazed central band. 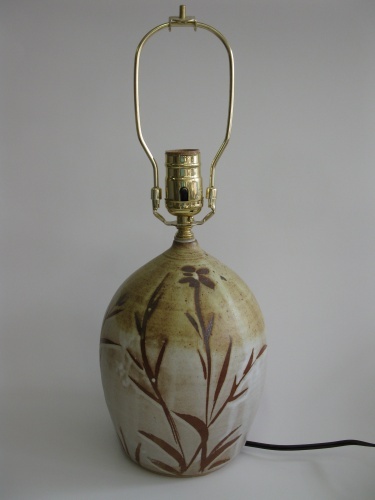 A wheel thrown lamp ideal in size for a bedside table, in earth tones, and a freely applied pattern of leaves and stems. 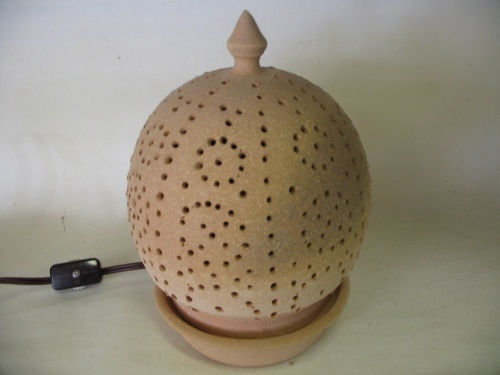 This unglazed, pierced stoneware lantern comes with a clear bulb that casts stars of light around a dark room. The bulb can be changed to a colored one for a cozy, less luminous effect. By day its sandy surface is reminiscent of a sea urchin. Price is 45 dollars, with shipping charges extra. FUNCTIONAL: mugs, bowls, pitchers, dinnerware and more. Making a ritual for this ultra-sweet treat can be fun when it's served on a tiny plate. I have many different colors and designs for these, which can also serve as mug lids and plates for pillar candles when there's no fudge in the house. a plate plus shipping. 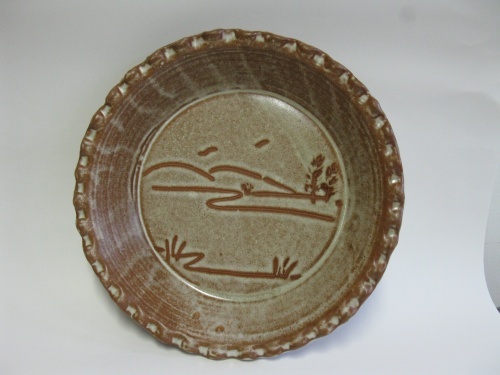 This platter would be equally at home as a serving dish or hanging on a wall--or going back and forth between the two. 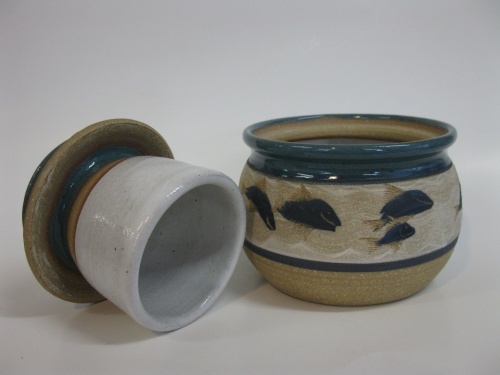 Made of stoneware clay and layered with multiple glazes (all food safe) in varied colors. 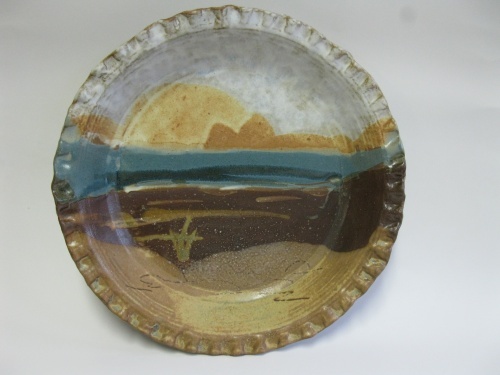 In this style of glazing, I have been inspired by the landscape of the West. Based on an old idea pre-dating refrigeration, this butter keeper (sometimes they're called butter-bells) keeps butter from turning rancid by submerging it under water. The butter is pressed firmly into the top section, and enough water is kept in the lower to cover the butter once it is lowered in. To serve it, just place the top part, butter side up, on the table. Butter stays soft because it's not refrigerated. 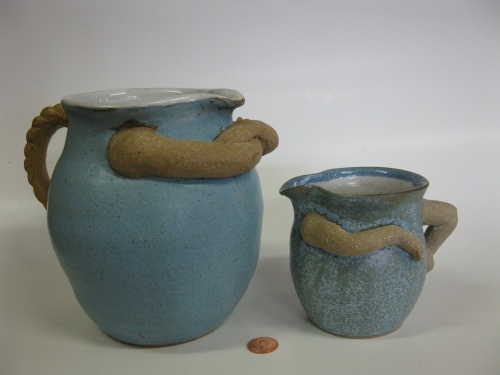 A quart pitcher in porcelain, with a clear liner glaze and a black slip glaze applied to the outer surface in the "greenware" state. 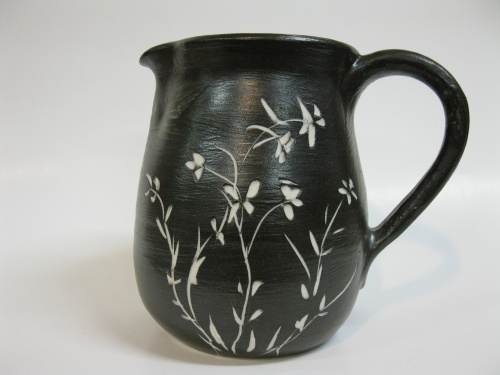 The design is then etched through the black glaze to the white clay beneath. 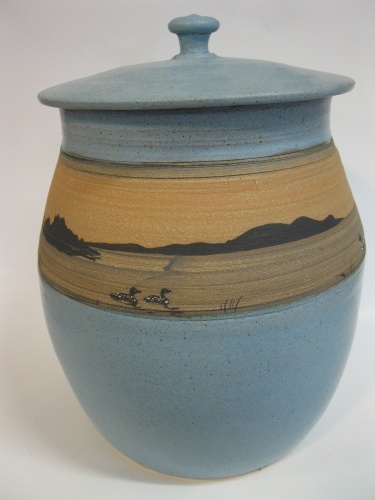 A large jar which could be a flour canister as well as a cookie jar, this is wheel-thrown and hand decorated, then bisque fired,glazed with a white liner glaze and a matt blue exterior glaze. 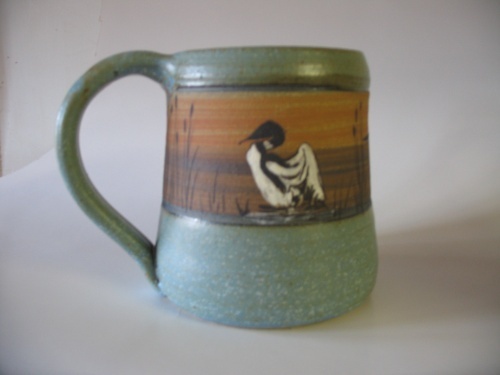 I make lots of mugs decorated with slip paintings of loons, some flying, sometimes swimming with their young, or, like this one, stretching its wings.Price varies from 20-24 dollars depending on size. Shipping extra. 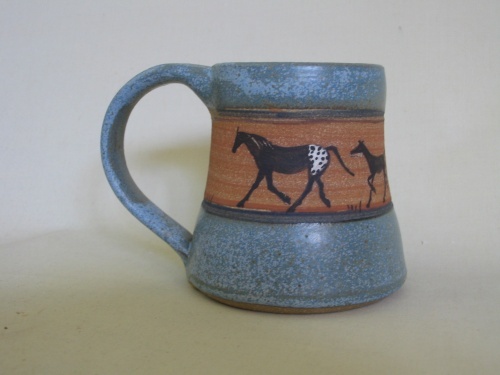 I make lots of mugs decorated with horses: Appaloosas, pintos. and sometimes dappled greys or bays. Each one is different, but related.Price varies from 20-24 depending on size. Shipping charges are extra. This tiny curled up kitty looks like a cat named Misty I used to know. Made on my potter's wheel and altered (no double entendre intended) by squeezing, pinching, and other techniques that sound painful, but the cat didn't feel a thing; she slept right through! 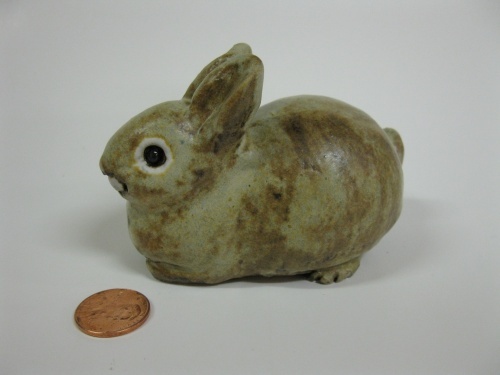 This tiny rabbit is very lifelike with its dark and shiny eyes, and its hint of a smile. Begun as a hollow egg shape on my potter's wheel, it was hand sculpted into its finished shape, then glazed and fired at cone 7 reduction. This little fellow can inspire an insomniac to curl up and give in to slumber. Made of stoneware clay on a potter's wheel, glazed and fired to cone 7. This little turtle is a bit larger and certainly more colorful than the traditional ivory netsukes, but it traces its clan lineage to them. 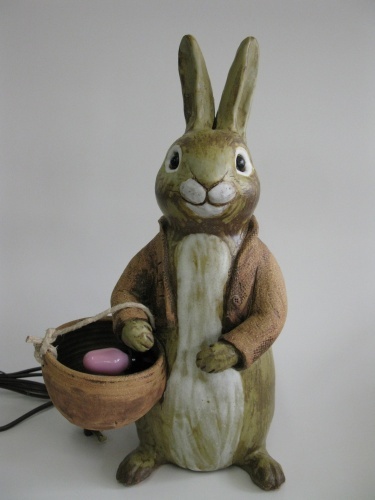 Begun as a hollow egg on a potter's wheel, it hatches (with considerable handwork) into a glazed and fired clay sculpture with a lifelike charm. 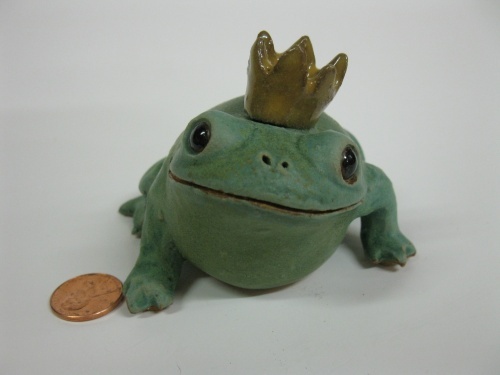 This soulful little frog wears its crown with dignity and humor, as all royals should. 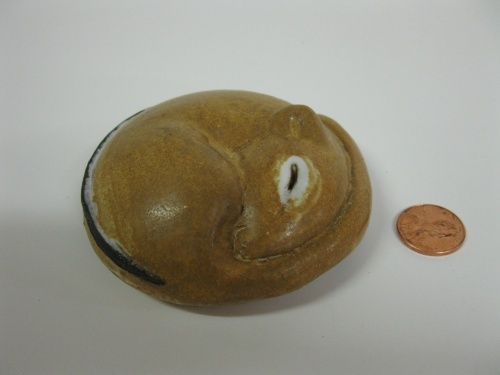 Begun as a hollow stoneware "egg" thrown on a potter's wheel, it was glazed and fired in a gas kiln to cone 7. 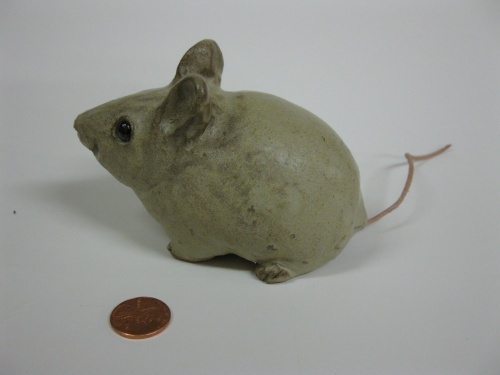 This little stoneware creature has a cord of leather as its tail for a very mousy look. 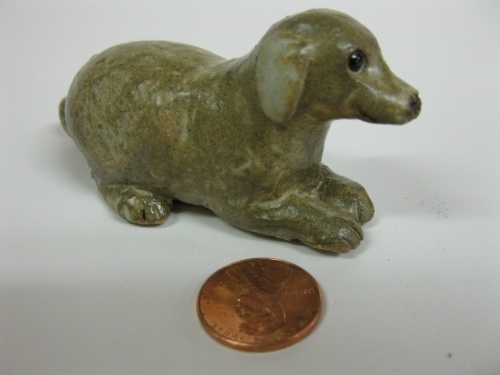 Its lineage falls somewhere between the tiny carved ivory netsuke from the Boston Museum of Fine Arts and the larger(but still small) red iron dog on my mother's kitchen shelf. This mouse is now sold, but I usually have more in stock. Call for pictures. 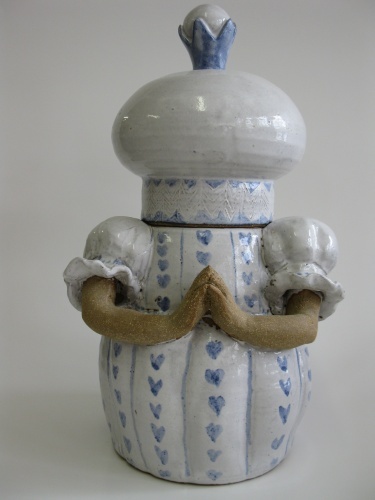 An opinionated and somewhat bossy cookie jar, with a white and blue glazed dress and a regal hat. She nevertheless begs you to partake. These functional stoneware pitchers have quite an attitude. 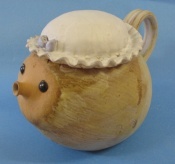 The handle of the mother pitcher is a braid; her arms are crossed crossly. The creamer (daughter) has her handle/arm on her hip. She really doesn't let her mother bother her in the slightest. Each is available separately ( the mother is and the daughter is ) or as a pair. p.s. as of nov.2012 these particular pitchers have sold but I have more not pictured. 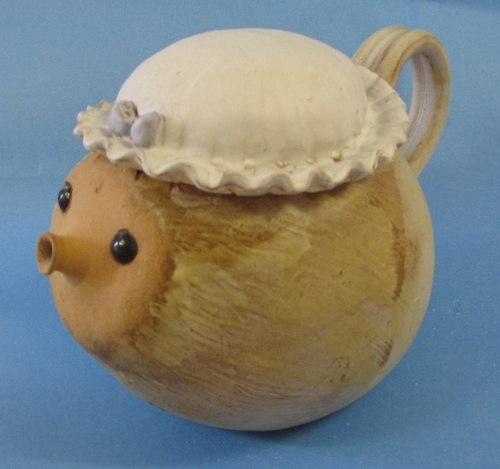 This Tiggy-Winkle teapot will brew your tea with the same cheerfullness with which Mrs. Tiggywinkle did the laundry. Holds about 4 cups. , with shipping charges extra.